When I finally saved up some cash and got my first good chef's knife, I vowed to do everything by the book: clean it properly, hone it regularly, sharpen it faithfully, stand by it in sickness and in health, blah blah blabbity blah. Recently, though, I've vowed to correct my sloppy ways. I'm going back to my knife whisperer, whose honing and sharpening skills I trust more than my own (I gave honing a try, and while I was okay at it, my knife felt infinitely better after I took it to a pro). However, when it came to sharpening, I needed a good at-home solution. While getting your knife sharpened by a pro is pretty cheap, it's just not practical for me to get it done as much as I need. I use my chef's knife throughout the day, and it loses its edge fairly quickly thanks to all the root vegetables, greens, garlic, poultry, fish, and beef it encounters. I love this little son of a gun so much I want to shake it like a Polaroid picture. This knife sharpener embodies three seemingly contradictory principles: it's affordable; it's built to last; it performs incredibly well. But mostly I love it because it keeps my knives—even the cheap ones—very sharp and even a dummy (ahem) can use it properly. Seriously. 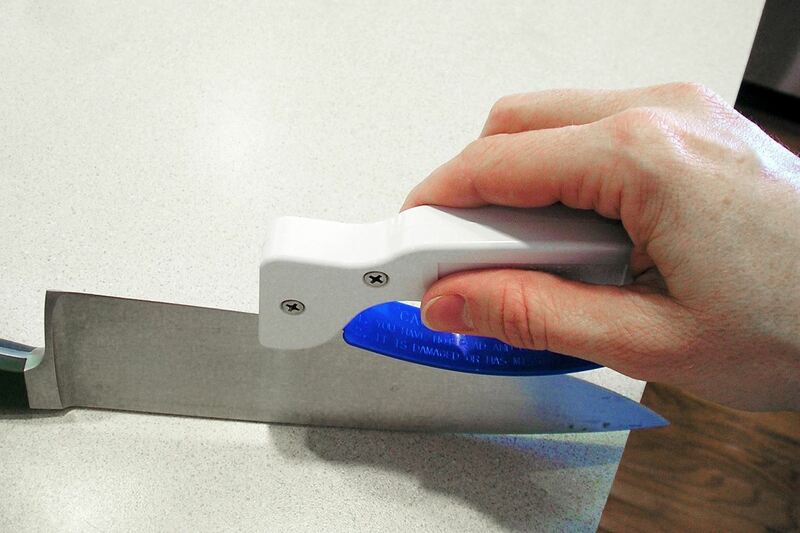 While whetstones are a great way to sharpen knives (hell, you can even use newspapers or coffee mugs in a pinch), it can be tough to understand what angle is required to get the requisite edge. 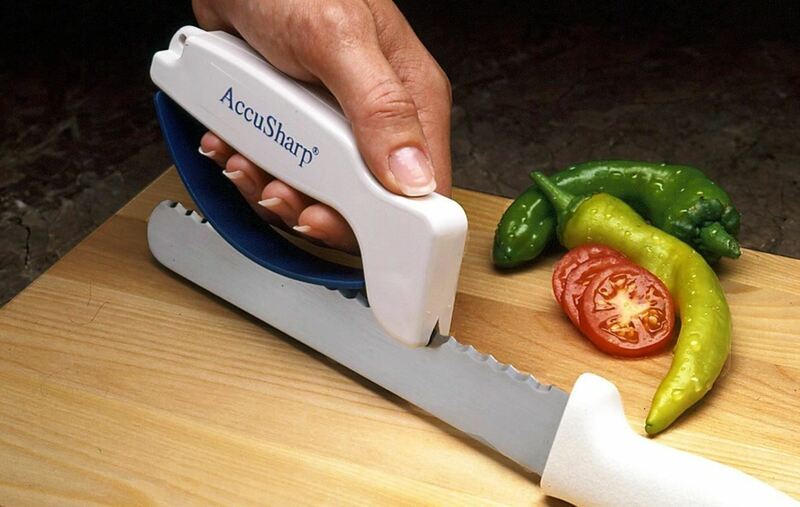 The AccuSharp removes all the guesswork. All you have to do is hold your knife on a flat surface, cutting edge facing upward, and run the AccuSharp along said edge however many times you desire. It even works on serrated blades. The difference I feel before and after using an AccuSharp is real: post-sharpening, my knife once again slides almost effortlessly even through something as tough and fibrous as beets. No hacking or sawing is necessary, which saves me from potentially cutting myself—or sending vegetables flying across the kitchen. A couple of things to note: the tiny tungsten carbide blades inside the AccuSharp will shave off microscopic amounts of steel with each stroke, so use a light hand. It's not noticeable, even after dozens of uses, but why take off more steel than you have to? 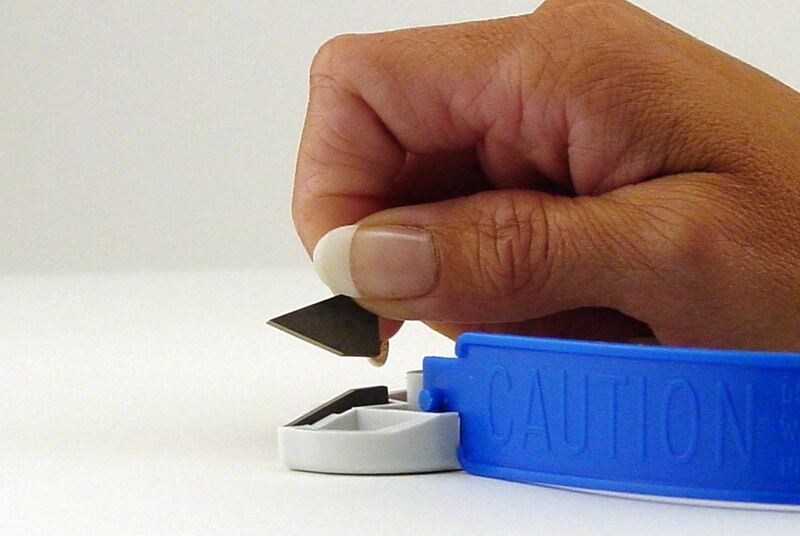 Also, if your AccuSharp starts to lose efficacy, said tiny tungsten blades are replaceable. And while the AccuSharp is no replacement for a professional sharpening job, it definitely works well enough so I only have to see my knife sharpener twice a year. As a sword aficionado might say, "Huzzah!"